The residents under the banner of Kallikuppam Gangai Nagar Pothu Nala Sangam filed a writ petition in the Madras High Court on Friday, seeking injunction on eviction. 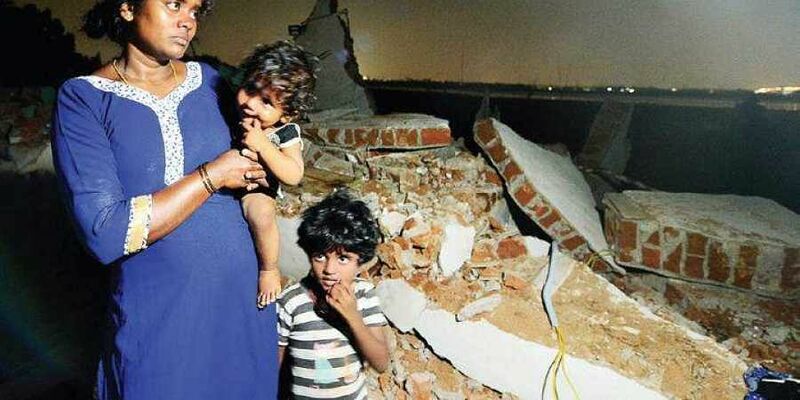 CHENNAI: In a massive crackdown, district authorities on Friday razed down 213 houses in Kallikuppam near Ambattur, amidst stiff opposition from residents, some of whom threatened to immolate themselves. The authorities have enumerated a total of 583 families, the remaining of whom will be evicted in a few days as part of the restoration of the Korattur lake. Revenue and Public Works Department officials launched the demolition drive early in the morning and continued till late in the evening with police protection. The residents, who claimed that they had not been given time to clear out their belongings, were seen searching for their children’s school uniforms, textbooks and other important documents amidst the rubble, late into the night. Among the families in SS Nagar, Muthamizh Nagar, Gangai Nagar and Moogambikai Nagar which were evicted, and slated for eviction in the coming days, are around 500 school-going children, they said. “Could they not have waited until the academic year is over? At the least, they could have given us a few hours to clear out our belongings,” said Leelavathi, an elderly woman, whose house was also razed. She has been staying in the house for the past 30 years. “We were given electricity, water connection, LED street-lighting etc., by the government and now they come and demolish everything. How is it justified?,” she grieved, speaking to Express. Hemavathi, who attempted self-immolation along with her 10-month-old son and five-year-old daughter, but was timely rescued by other residents, said, “What has happened to us is barbaric. My family lost everything. I was with my 10-month-old son in the house when heavy machinery was brought in. They didn’t even give me time to pick up the milk bottle to feed my son,” she alleged, sitting quietly amidst the debris. The residents under the banner of Kallikuppam Gangai Nagar Pothu Nala Sangam filed a writ petition in the Madras High Court on Friday, seeking injunction on eviction. K Gopi, sangam president, told Express that the High Court delivered an order in 2015, directing the State government to examine the possibility of an in-situ rehabilitation, considering the fact that these residents have been staying for years and making a livelihood there and also considering the children’s education. However, the residents have now been asked to shift to Perumbakkam around 35 km from their settlement. Loganathan, a resident of Gangai Nagar, whose house has been enumerated for demolition, said all the people had voter ID and ration cards. “Though we don’t have patta, the government has created the basic infrastructure and Ambattur legislator Alexander promised that our houses would not be razed down. But, today without any notice, authorities have come and demolished close to 300 houses and used police to intimidate us,” he alleged. Gnanasekeran, 66, suffered a mild heart attack during eviction, but he was said to be out of danger. His son Nagendran told Express that his father collapsed as their recently-renovated house was brought to the ground. Another allegation generally aired was that the authorities had turned a blind eye to plush apartment complexes, schools and colleges in the same vicinity. However, according to a Revenue department official, since the residents resisted when the notices were being issued, the officials forcefully stuck the notices on each house, with police protection. “We also have video proof. The notices were issued last month,” the official said, adding, “When we fixed dates for enumeration in a community hall, the residents refused to turn up,” he added.